Kailani Craine started figure skating at eight-years-old after attending a birthday party in her home town in Newcastle on the NSW central Coast. Her rise through the lower national ranks was swift winning her first Australian Junior title in December 2012, and again in 2013, 14 and 15. In 2014, Craine also contested the senior title and took the gold becoming the Australian Ladies Figure Skating Champion – a title she has successfully defended in 2015 and 2016. Craine’s international career began as a junior in 2012, placing 23rd but success was not long coming when she won the Junior division of Skate Down Under in Sydney in 2013 and silver at Lombardia Trophy in Italy. She went back to Lombardia in 2014 to win the Junior gold medal. Making her senior international debut, she took the silver medal at the MNNT Cup in January 2015. Juggling both Junior and Senior international competition, Craine competed at the 2015 ISU Four Continents Championship and in a breakthrough season placed a career-best 12th place and went on to place 16th in the Junior World Championships. Her final junior competition in late 2015 was the ISU Junior Grand Prix in Logrono, Spain she finished with her strongest Junior result at 8th place. In early 2016 Craine contested the Four Continents Championship, finishing 13th and then competed in her first World Championship placing 27th. Later that year she medalled twice with a bronze at the 31st Volvo Open Cup in Riga, Latvia and silver at the ISU Challenger event Warsaw Cup in Poland. 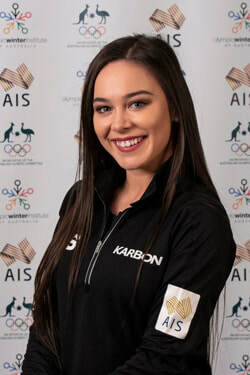 At the 2017 ISU Four Continents Championship Kailani Craine came away with 16th place at the Olympic Test Event and then 24th at her second World Championships in Helsinki, Finland. In the 2017/18 season Kailani has won a gold and silver medal in the ISU Challenger events (Nebelhorn and Warsaw). She was the first place Olympic qualifier to the ladies event in PyeongChang at Nebelhorn Trophy. Kailani made her ISU Grand Prix debut at Skate Canada in October 2017, placing tenth overall. Craine made her Olympic debut at the PyeongChang 2018 Games in the women’s individual event at just 19 years-old.Craine, who finished her debut Olympics in 17th, sailed through to the free skate of the Ladies Figure Skating, after a stunning short program which included a strong double axel and triple-double jump combination. Her score of 56.77 saw her qualify straight through to Free Skate. I began figure skating in 2007 when I was 8-years-old because it was a hot day and my family and I thought why not go ice skating? After that I went to a birthday party and got to wear a glittery purple skating dress… After that I started lessons I loved it so much. I enjoy my sport because ... I learn new things about myself every day through skating. It is the most fun thing to do in this whole world - inspiring and gives you something to work toward every day. I find that my sport is incredibly empowering and gives a sense of self confidence. It teaches me new lessons and always keeps me on my toes. It challenges me in a way that nothing else can, and for that I am incredibly grateful as it has made me such a stronger person. Skating is definitely the one thing I can always count on to always make me feel good and complete, but most of all skating is a part of who I am and makes me undeniably happy. Favourite international competition: Championships events - they’re the biggest competitions of the season, which means a huge crowd, lots of fans and lots of media, and also every one of my international friends will be there. It’s also nice to compete in huge arenas, it makes you feel like a complete rock star! Favourite other sport to watch or play: Snowboarding, Boxing, UFC, Soccer, and Tennis especially when the Australian Open is on. Favourite sporting team: All Australian sporting teams as I am very patriotic! Plus a few soccer teams such as Real Madrid and FC Barcelona. Love watching Team Money Mayweather fight, Floyd has a sense of confidence that is really inspiring and great to watch. Childhood Ambition: Represent Australia at the Olympic Games. Be an Olympian.